Kedron TE’5 Modest in name, the Kedron TE'5 Topender has enough Gall for Ros and Chris' big lap. 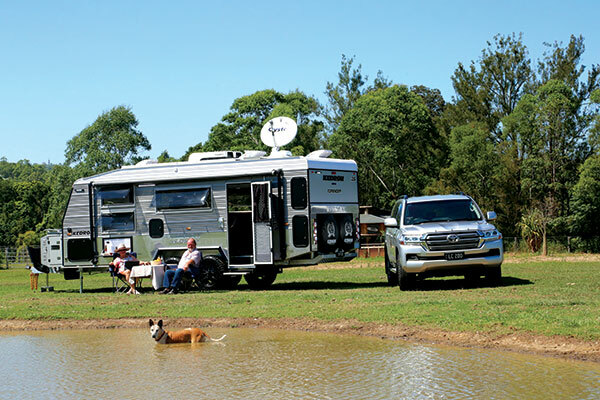 In the Australian caravan manufacturing business over the last decade, there has been a veritable explosion of 'offroad' caravans, with terms like “extreme” and “ultimate” being bandied about with enthusiasm. Overuse might be a word I’d use, with some manufacturers seeming to think it’s okay to fit a beefed-up chassis without doing much about the body above. 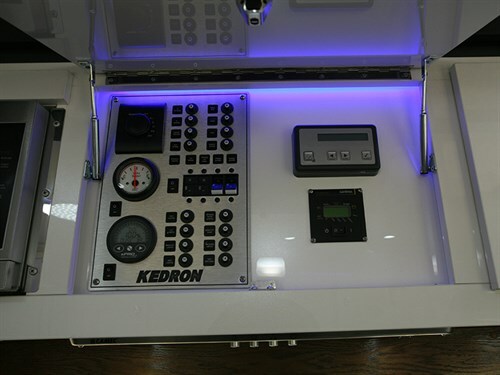 However, there are quite a few boutique manufacturers like Kedron Caravans that specialise in offroad caravans and will use ordinary names, like say, the TE’5 Topender. A name without too much pretension that suggests where the van might be capable of travelling to. It also happens to be the flagship range in the Kedron stable. Kedron’s marketing man Glen Gall grins when I mention the above subject of “offroad” caravans as he introduced me to Chris and Ros Weeks, two very new owners of a TE’5 Topender who are obviously very enthusiastic about their new van. Like all the Kedron range, it’s built with plenty of experience, a.k.a., the Gall Boys and their outback travels behind it. Underneath the Topender, the hot-dipped galvanised chassis is built with dual 100 x 50mm (4in x 2in) rails in the standard box section style. The tandem-axle suspension, an airbag setup with trailing arms and dual shock absorbers is a Kedron design. The Kedron Recovery Stub (KRS) setup is designed for the ease of replacing the axle stub should that be necessary for out of the way places. Similarly, the aluminium frame is built for offroad travel. It’s not just welded but connected together using Henrob pins and Huck bolts — all designed to hold everything together in a rigid cage. Like many vans, the Topender has aluminium cladding, which Kedron does everything possible to seal it off from water leaks. However, like a few other manufacturers I've met lately, Kedron is moving towards using materials that aren't affected by water leaks. Thus minimising any damage, should a leak occur. An obvious feature of the Topender is the drawbar storage bin, which is enormous. It contains several compartments for items like a generator or extra fridge plus two vented compartments for jerry cans thus protecting them from road damage. Although the gas cylinders sit between two jerry can holders, they have a mesh stoneguard in front of them. Something to keep in mind with this arrangement is the loaded ball weight. If in doubt, I’d suggest a weighbridge check. A benefit of the van having a body length of 6.4m (21ft) is that the designer has plenty of room to play with in order to give it a comfortable layout. 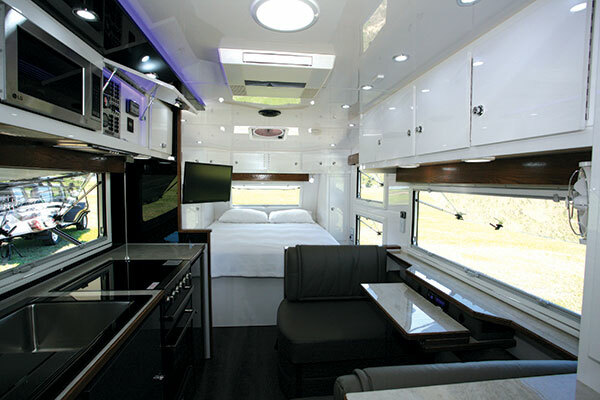 There’s nothing surprising about the overall layout — it having a full-width rear bathroom, front island bed with nearside kitchen and offside dinette, in between. What is most pleasing, is that all the separate areas have not been compressed to fit something else in — it’s all very user-friendly with room to move. Something that does catch the eye very quickly is the striking colour scheme and overall finish. Glossy laminates might be a bit difficult to photograph but they certainly look good. Many caravan manufacturers tend to put large windows either side of island bed, as does Kedron. Nothing wrong with that, except that the windows are often low enough for unwanted visitors to climb into. A neat solution employed by Kedron is to fit two shallow windows, one above the other. You get the same window area but they are less inviting to potential thieves and the lower one can be left closed without losing ventilation—which is particularly handy at night. Kedron kitchens always have a touch of class about them, as does this one. It comes with all the expected items—full stove, Kedron-designed sink and drainer, microwave and a decent sized 218L fridge. There is plenty of cupboard and drawer space, including an extra cupboard and drawer fitted inbetween the fridge and cafe-style dinette. There’s no doubt the dinette is built to comfortably accommodate two. That includes a couple of neatly designed footrests that make sitting back and relaxing not hard at all. Of note is the tri-fold table. It’s been designed to fit in with a panel that contains a radio and 12V/5V USB outlets and a shelf that runs under the window—a neat touch that looks quite stylish. Across the rear, the bathroom has a square look to it but is mostly functional rather than for design. Certainly, there’s enough room for a pedestal-style washbasin, shower cubicle, wall-mounted Daewoo washing machine and a cassette toilet. Ventilation fans are fitted at either end of the bathroom to aid airflow. With a Tare weight of 3115kg, the Topender is no lightweight but it does have an ATM of 3500kg, giving it a reasonable load capacity. However, for those who like to carry a fair bit of load, don’t forget that full water tanks will absorb 260kg and the van can be upgraded to an ATM 3990kg. However, that does mean a tow vehicle larger than a Toyota LandCruiser, which elevates the total price tag somewhat. Whilst many think of an offroad van as having a beefed-up chassis and body structure, along with that goes with the sustainability of remote travel. No problems in this case with two 100L freshwater tanks and an extra 60L of drinking water. In addition, 300Ah of lithium battery capacity and 450W of solar generating capacity will keep the 12V electrics going very well, which is good because there is an optional 1800W inverter fitted. On the subject of electrics, the main control panel is located in the van in an overhead locker. All the individual circuits are clearly marked, making fault tracing very easy. It’s easy to be impressed by the TE’5 Topender, which is something you’d expect in the price range. It’s clearly a van designed with practical experience behind it, as some of the construction techniques demonstrate, both above and below the chassis. It also has plenty of capacity in the water and electrical departments for extended outback travel, which, after talking to the new owners will definitely be put to use.